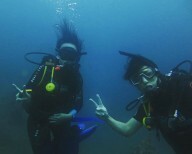 Travellers are required to be certified PADI Open Water Divers before booking this fun scuba dive in Bali. Your day begins with a hotel pick-up that'll take you to the dive center in Amed. Here, you'll meet your dive instructor and head out from the island to specific dive sites to complete two open water dives. Swimming down to a maximum depth as allowed by your prior level of certification, you'll explore a wide array of the marine life, from crabs to sea turtles, and admire gorgeous views of reefs and corals covering the dive sites. The day's session ends by late afternoon. Your trip ends here.